When I have errands to run, I’ve learned not to expect to get anything done between 10:00 and 10:30am. 10 o’clock is ‘marenda’ time you see, a sacrosanct time of the day when workers across Istria are taking their morning break. Since most offices and workplaces start their workday at 7am, 10am is usually break time. So now I know not to bother going to any administrative office, the electricity board, or even to the shoemaker between 10 and 10:30am because I’ll just be wasting my time waiting for them to come back from their Marenda break. Sometimes Marenda can even stretch to 11am, so 10-11am is a ‘no-go’ time! Marenda comes from the Italian word merenda and this habit or custom must be a legacy of Italian times. While in Istria marenda is a snack or light meal eaten between breakfast and lunch, in Italy merenda is usually an afternoon snack. 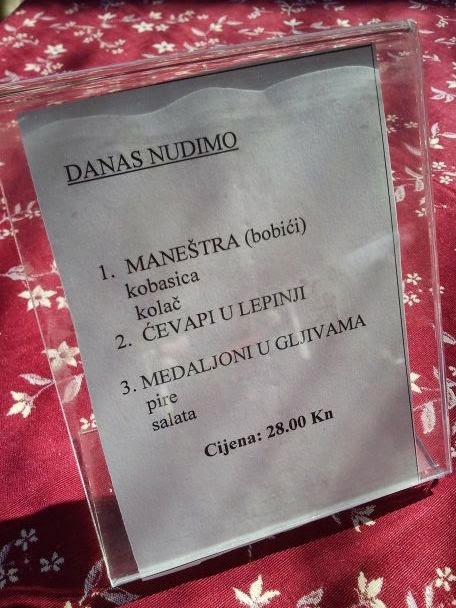 Many local restaurants in Istria have a special marenda menu at a set price meant for workers who’d like to have a cheap and filling meal. In restaurants in the nearby town of Pazin (there are only two! 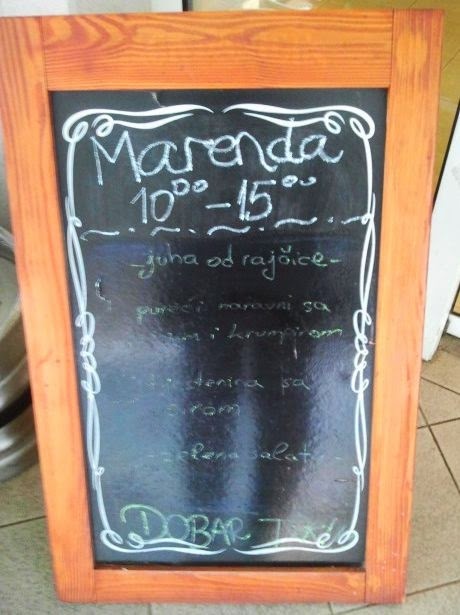 ), marenda is super cheap at 28 Kuna (3.65 Euro). For this price a hot meal of a main dish is served with two side dishes and often a small salad. The special marenda menu usually has three or four main dishes to choose from. Since marenda is a light meal eaten between breakfast and lunch, this means there are four mealtimes in Istria. Breakfast is a very light meal (or some skip it entirely) followed by marenda, while lunch is the main meal of the day, and dinner is again usually something light. Four mealtimes – why not? Any excuse to eat is a good one in Istria! Yes, it's difficult to go hungry on such a schedule! Thanks for stopping by my window, Vanessa!